Tess DuFrechlu of Biofuel Oasis likes the pay equity. Andrea Hurd of Mariposa Gardening was nowhere near retirement when she decided a few years ago to convert her business to a worker cooperative. She had grown her company and developed her own style of ecological garden design. "As a woman in a male-dominated industry, I felt a huge passion for building a larger company," she recalled. But at the same time, she didn't want to become a full-time business manager like many successful contractors. 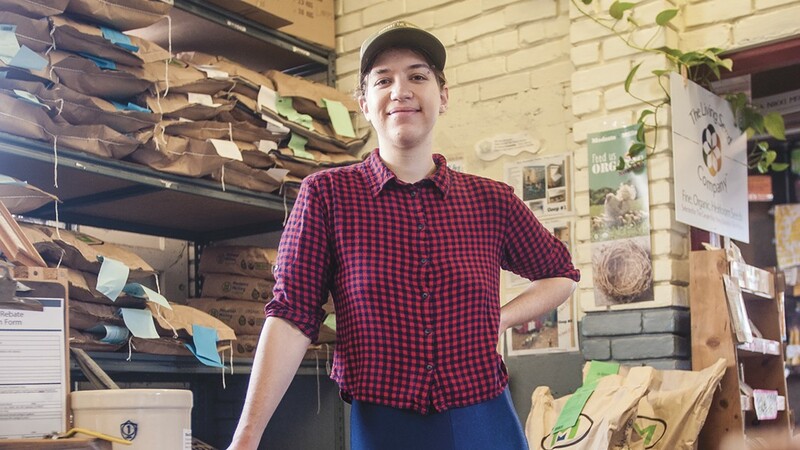 Now, as a worker-owner of the Mariposa Gardening Cooperative, she shares management and gardening with other worker-owners. Hurd said she couldn't have done it without a lot of help — participation in the Sustainable Economies Law Center's Worker Co-op Academy and a year of mentoring from Project Equity. Co-ops need extra support getting started, said Jordan Klein of Berkeley's Office of Economic Development, because of "the general unfamiliarity with worker co-ops as a model." In addition, he said, co-ops sometimes face barriers getting financing, or even simply filling out forms required by local or state regulations. "I also wanted to help build a better economic base for the community," Hurd added. "The landscaping industry is historically very exploitative of its workers." Worker-owners of co-ops like Hurd's have been active in pushing Berkeley and Oakland to provide city support for co-op development through the Network of Bay Area Worker Cooperatives (or NOBAWC, which they pronounce "no boss.") "People's lives are changed by working in a worker co-op," said former co-op member Foresta Sieck-Hill, now a network staffer. "There's personal growth and the potential to contribute to the local community. Think about the Cheeseboard. What a gift to work as a baker: make a living wage, and be surrounded by this vibrant community. Most people who work in restaurants work for slave wages for someone who doesn't appreciate them." Last week, the Cheeseboard's longtime home committed to a new strategy for fighting economic inequality and building the local economy: city support for worker cooperatives. The Berkeley City Council voted unanimously on Fe.26 to include co-ops in the city's small-business revolving loan fund; give co-ops, along with women- and minority-owned businesses, preference for city contracts; and provide ongoing technical assistance to help existing small businesses convert to worker cooperatives. "This is such a Berkeley thing," Mayor Jesse Arreguin said at the meeting. "We have a long history of encouraging co-ops — especially now that wealth is being concentrated at the very top." He predicted that Berkeley's support for co-ops will be "a model for the rest of the Bay Area and the country." It's been three years since the council passed a resolution by then-Councilmember Arreguin directing city staff to develop support for worker cooperatives. After many months the project was assigned to the Office of Economic Development, then faced further delays because of staffing turnover and shortages. Other delays were more existential. After all, noted office Director Director Jordan Klein, "Municipal support for worker co-ops is still a relatively new thing." Despite the delays, Klein and a colleague made genuine efforts to understand and integrate worker co-ops into the program, said Yassi Eskandari-Qajar of the Sustainable Economies Law Center, which supports cooperative development. Finally last November, the city came up with a specific proposal for ways to adapt the revolving loan fund to be accessible to co-ops. It also contracted with the nonprofit Project Equity to provide small businesses technical assistance to convert to worker co-ops. Advocates say such assistance is urgent, because baby boomers own almost half of Bay Area local businesses and six of 10 local business owners plan to retire in the next 10 years. In the face of this "silver tsunami," conversion to worker cooperatives "is a way to keep these beloved businesses locally owned and make business owners out of people who are most likely minimum-wage workers now," said Eskandari-Qajar. "It's the best, most natural way to work," said Adrionna Fike, a worker-owner in West Oakland's Mandela Grocery, who testified at the Berkeley City Council meeting last week. Fike said shoppers are curious about her co-op "because they see us happy at work. They say, 'why are you all always in a good mood?'" The answer, Fike said, is that "we are really into our jobs as grocers. We have control, full responsibility, a high level of service. And customers respond in a more positive way." Tess DuFrechlu, a worker-owner at the Biofuel Oasis in Berkeley, said, "I like the way we distribute the work. We all do a little bit of everything, cleaning, unpacking the chicken feed, Quickbooks. I like the pay equity, the transparency. It's interesting to learn how to run a business and it feels good when you can collaborate with other people." The co-op model also makes the business more responsive to customers, she said, because the owners directly interact with them. And because all the income is divided among the workers, co-ops keep more money in the local economy. Interest in worker cooperatives has grown since the 2008 recession. Esteban Kelly, director of the U.S. Federation of Worker Cooperatives, told the Co-op News last year that the number of worker cooperatives in this country has almost doubled in the last 10 years, primarily in communities of color and especially in immigrant communities. Some other cities, including New York, Cleveland, and Madison, Wisc., have provided some support for worker co-op development, although none has a program as comprehensive as the one Berkeley is committed to developing. "We are fortunate in the East Bay that we are home to organizations like the Sustainable Economies Law Center and the East Bay Community Law Center that are advancing policies at the local, state and national level that promote economic justice and inclusive economic development," said Klein of Berkeley's Office of Economic Development. In 2015 those organizations and others won a state law making it easier for worker cooperatives to get started and attract investment. In Oakland, however, support for worker co-ops has been stalled for more than two years, since then-City Councilmember Annie Campbell Washington first introduced a co-op support measure in the fall of 2016, then delayed it indefinitely. "Considering all the work that had gone into it, it was rather absurd, the amount of delays that basically compounded into ghosting, to borrow a term from the dating world," Eskandari-Qajar recalled. A source familiar with Oakland's local economic development community had the impression that Campbell Washington let the measure die because of concerns that the small-business community would object to creating a city purchasing preference for coops. But Eskandari-Qajar said work on the measure did raise awareness about co-ops in the city. Worker co-op development is mentioned in Oakland's plan for increasing economic equity, one of the goals of its 2018-2020 economic development strategy. And the city's Office of Economic and Workforce Development has been partnering with the nonprofit Greenlining Institute, which recently got grant funding for a full-time "economic equity strategist" to work in that office.